Edna Florence Staley was born on 26 January 1898 in Buffalo, Erie County, New York. She was known as Edna Wilson although it is not known whether she was formally adopted by her stepfather Robert Wilson. William Miller and Alice Maude Philpott appeared in the US federal census of 1 June 1900 in Niagara Falls, Niagara County, New York, at 1024 Michigan Street. Other members of the household included Edna Florence Staley, Alice May Staley, William T. Miller, Henry Miller and Charles Miller. Robert Thomas Wilson appeared in the New York state census of 1 June 1905 in Buffalo, Erie County, New York, at 310 Bird Avenue. Other members of the household included Edna Florence Staley, Alice Maude Philpott, Hugh Wilson, James L. Wilson, Roberta Wilson and Alice May Staley. Daughter Agnes was enumerated in the household of her uncle James Wilson in Buffalo. Robert Thomas Wilson and Alice Maude Philpott appeared in the US federal census of 15 April 1910 in Royalton Township, Niagara County, New York, at Lewiston Road. Other members of the household included Edna Florence Staley, Hugh Wilson, James L. Wilson, Roberta Wilson and Alice May Staley. Robert Thomas Wilson and Alice Maude Philpott appeared in the New York state census of 1 June 1915 in Royalton, Niagara County, New York. Other members of the household included Edna Florence Staley. She was a telephone operator, according to the 1915 census. The following appeared on 4 November 1916 in the Lockport Union-Sun & Journal: (Gasport, Nov. 4) Miss Grace Peck and Miss Edna Wilson have entered the Bettinger Business College of Lockport. The following appeared on 6 March 1919 in the Lockport Union-Sun & Journal: County Clerk T. T. Feeley today received a list of additional notaries public appointed by Governor Alfred E. Smith at Albany for Niagara County. The notaries: . . . Edna Wilson, Gasport. The following appeared on 19 August 1919 in the Lockport Union-Sun & Journal: (Gasport, Aug 19) Charles Lord, Mr. and Mrs. Raymond Pierson and Miss Edna Wilson have gone on a motor trip through the Adirondack mountains. Robert Thomas Wilson and Alice Maude Philpott appeared in the US federal census of 1 January 1920 in Royalton, Niagara County, New York, at Hartland-McNall Road. Other members of the household included Edna Florence Staley, Alice May Staley. She was an office stenographer, according to the 1920 census. The following appeared on 11 May 1923 in The Niagara Falls Gazette: (Somerset-Barker) Mr. and Mrs. D. D. Vickers had as Sunday guests Miss Edna Wilson of Lockport, who recently returned from California, and Charles Lord. The following appeared on 20 February 1924 in The Niagara Falls Gazette: (Gasport) The following who attended the Valentine dance given by the Masons at Middleport, last Thursday, were: Mr. and Mrs. C. A. Reef, Mr. and Mrs. M. F. Chaplin, Mr. and Mrs. F. J. Ritchie, Mr. and Mrs. H. W. Burt, Chas. Lord and Miss Edna Wilson of Lockport. Robert Thomas Wilson and Alice Maude Philpott appeared in the New York state census of 1 June 1925 in Lockport, Niagara County, New York, at 247 Lock Street. Other members of the household included Edna Florence Staley. Also in the household was boarder Bruce Philpott (age 21), likely Alice's nephew. She was a stenographer, according to the 1925 census. Robert Thomas Wilson and Alice Maude Philpott appeared in the US federal census of 1 April 1930 in Lockport, New York, at 247 Lock Street. Other members of the household included Edna Florence Staley. She was employed a stenographer at a felt mill, according to the 1930 census. The following appeared on 2 April 1932 in the Lockport Union-Sun & Journal: Sixteen officers and foremen at the Lockport Felt Company's plant in Newfane gathered at the Tuscarora Club last evening to pay a tribute to one of their number, in the person of Joseph Robinson, vice president and mill manager, and connected with the firm the past 36 years, yesterday marking his 75th birthday. William H. Lee of Locust street, treasurer and general manager of the firm, in the course of his congratulatory remarks following the repast, presented to Mr. Robinson on behalf of his associate executives, a solid gold, full jewelled Swiss watch. Those in attendance included beside Mr. Robinson and Mr. Lee, Senator William W. Campbell, president of the company; Lester J. Robinson, son of the guest of honor, and mill superintendent; Miss Edna Wilson, secretary to Mr. Lee. . . Many of the officials, foremen, foreladies and other employes have been with the company for remarkably long periods of time, notable Mr. Horton for 37 years. . . and Miss Wilson four years. The following appeared on 12 May 1934 in the Lockport Union-Sun & Journal: Niagara County Clerk's Office, Lockport, N. Y., May 11, 1934 (Deeds) . . . Alice M. Wilson to Edna Wilson, City. The following appeared on 3 March 1936 in the Lockport Union-Sun & Journal: Several hundred notaries public appointed by Edward J. Flynn, secretary of state, Albany, for a two-year period beginneng April 1 will be sworn in this month by County Clerk Jesse Read. Mr. Read has arranged to visit the city hall at North Tonawanda on March 10 to swear in notaries there. On March 12 he will swear in notaries at Niagara Falls. On all other days notaries may come to the county clerk's office here to receive their oath.
. . . Edna Wilson, 247 Lock street. . . The following appeared on 8 June 1937 in the Lockport Union-Sun & Journal: (Gasport) Mr. and Mrs. Robert Wilson of Los Angeles, Calif., who are spending the Summer with their daughter Miss Edna Wilson of Lockport, have been calling on friends here. Mr. and Mrs. Wilson are former residents of Gasport. Edna Florence Staley appeared in the US federal census of 1 April 1940 in Lockport, New York, at 247 Lock Street. She was employed as a stenographer by a felt factory, according to the 1940 census. Alice Wilson was photographed with her daughter Edna Staley. The following appeared on 25 January 1952 in The Niagara Falls Gazette: (Newfane) Officers and directors of the Lockport Felt company for the ensuing year were elected yesterday at the annual meeting. Former State Senator William Lee, Lockport, remains as chairman of the board and his son, Raymond J. Lee, was renamed president, and treasurer. Other officers re-elected included first vice president, Mrs. Elizabeth M. Lee, Lockport; assistant secretaries, Miss Edna Wilson and Howard Murrell; comptroller, C. Joseph Price; assistant treasurer, Lesley H. Ricketts. The following appeared on 5 August 1953 in The Niagara Falls Gazette: (Newfane) Miss Edna Wilson, who went to work for the Lockport Felt company on a temporary basis in 1928 and remained for 25 years, was honored by the company management and employes at an informal gathering. Miss Wilson is the private secretary of William H. Lee, chiarman of the board. 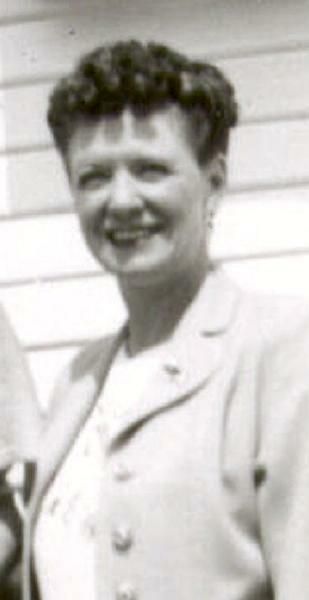 She was named assistant secretary in January 1947, and made assistant to the president in 1950. The following appeared on 6 May 1954 in the Lockport Union-Sun & Journal: A trust fund for the widow, Elizabeth M. Lee, and a son, Raymond J. Lee, are set up in the will of former State Senator William H. Lee which was on file today at the Surrogate's Office. Bequests of . . .
Mr. Lee, chairman of the board of directors of the Lockport Felt Company, died April 29. . . .
. . . To his "faithful secretary" Edna Wilson he left $2,000. . . . The following appeared on 14 January 1955 in the Lockport Union-Sun & Journal: One new director was elected at the annual stockholders' meeting held Thursday afternoon at the Lockport Felt Company in Newfane. He is Albert W. Sterritt of Lockport. During the directors' meeting which followed, Mr. [Raymond J.] Lee was elected chairman of the Board, succeeding his father, the late former State Senator William H. Lee. . . .
Other officers are: . . . assistant secretaries, Mr. Miller and Miss Edna Wilson of Lockport. . .
She officially witnessed the death of Alice Maude Philpott on 1 May 1957 at Four Palms Rest Home, 1001 South Osage Avenue in Inglewood, Los Angeles County, California. Raymond J. Lee, the company's board chairman, president and treasurer. . .
At the directors' meeting, Mr. Lee was elected chairman of the Board, president and treasurer. . . William E. Miller and Edna Wilson, assistant secretaries. . . . The following appeared on 8 August 1966 in the Lockport Union-Sun & Journal: Auction: Aug. 9, Tuesday evening 7 P.M. at 5673 West Bluff, Olcott, 1/4 mile west of stop light over bridge and turn right on Clinton St.
Two tilt top tables (one walnut), Mahogany pedestal, Cherry Magazine rack, Portable bar, Ladder back chair, Small drop-leaf table, Two dining room drop leafs, dining room suite, round table, buffet & china cabinet, Three quarter iron bed, Old lyre stand table, 20" Stromberg TV, works good; Table model TV, General Electric record player & radio, Claw-foot round dining room table, Mahogany credenza, Brass Bed, Old desk, stone jugs, curtains, drapes, chest of drawers, comode, yard furniture, lamps and many other ites. Edna Wilson owner, Ben I. Weld Auctioneer. The following appeared on 3 November 1967 in the Lockport Union-Sun & Journal: Edward Conner, 26, of 2516 Main St., Olcott, is in fair condition at Inter-Community Memorial Hospital at Newfane, following injuries received in an accident early Sunday. Mr. Conner suffered extensive facial lacerations in the two-car collision, which occurred Sunday at about 2:30 a.m. Treated and released from the Newfane hospital with less severe facial lacerations was Miss Edna Wilson, 69, 5675 West Bluff, Olcott. State police said the accident occurrec on the Wilson-Burt Road at West Creek Road in Newfane. Mr. Conner was traveling east on the Wilson-Burt Road and Miss Wilson north on West Creek Road. The cars collided at the intersection. Miss Wilson was given a summons charging failure to yield the right of way and will appear before Peace Justice Clive Merritt. In December 1975, Edna Florence Staley was living in Olcott, Niagara County, New York, at 5675 West Bluff according to her sister's death certificate. She officially witnessed the death of Alice May Staley on 14 December 1975 at Daniel Freeman Hospital, 333 North Prairie Avenue in Inglewood, Los Angeles County, California. The SSDI lists Olcott, Niagara County, New York, as the last residence of record of Edna Florence Staley. Edna Florence Staley died on 9 December 1983 at age 85 in Newfane, Niagara County, New York, at Inter-Community Memorial Hospital and her remains were cremated. The following appeared on 10 December 1983 in the Lockport Union-Sun & Journal: Edna Wilson, of 5675 West Bluff, Olcott, died Friday, Dec. 9, 1983 in the Inter-Community Memorial Hospital at Newfane. Born in Buffalo, she was the daughter of William and Alice Philpott Staley. She had been employed as an executive secretary at Lockport Felt Company until her retirement in 1960, when she moved to Olcott. She was a member of the Olcott Yacht Club. Sister of the late Alice Marhoefer, she was the friend of Marion Martin, of Lockport. There will be no prior visitation. A Memorial Service will be held at a time to be announced by the Rutland-Corwin Funeral Home, Inc., Newfane. Should friends desire, memorials to the Inter-Community Memorial Hospital Development Fund would be appreciated.